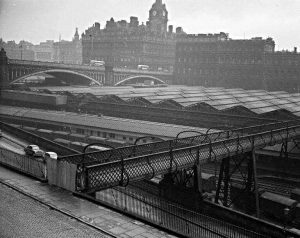 The Waverley options include completely new concourses at high level, going the whole length of the station. Consultation on initial ideas and options is now underway, before moving on to the design stages. Please submit your ideas to the consultation now. The consultation page, including an online survey, is at consultationhub.edinburgh.gov.uk/sfc/waverley. There’s an open-ended question (Q13) at the end of the survey, where you can enter anything not covered in the earlier tick-box questions. Consultation closes 25 April. PDF (3.5MB) of the background and the various options being considered. Here are some points Spokes thinks are important. If you agree, please include them in your response (in your own words). If you think we’ve missed anything important email bikerail@spokes.org.uk. Cycle access to and from the station, including routes to all current and proposed entrances, from the wider street network. In particular, linking entrances to the cross-town cycle routes now planned, such as the West-East route, and any further routes from the forthcoming Council Transformation proposals. (b) a route between the Old Town (Jeffrey St) and Calton Road (for Leith Street & St James). Note that many years ago there was a pedestrian/cycle bridge providing this connection. The proposed high-level concourse provides a superb opportunity to re-instate the connection (which would of course also give access to the station itself). Furthermore, the Council is planning to upgrade pedestrian/cycle conditions on the stretch of Calton Rd between Waverley and Leith Street, so a connection to/from the Old Town via Waverley makes huge sense. A Cycle Hub within the station, to include secure bike storage, info, bike hire, maintenance (e.g. your bike could be serviced whilst you are at work). Indeed, a cycle hub (CyclePoint) “including sales, maintenance and hire” is promised under the current franchise [see 2.1.1 here] but has not yet materialised. Bike parking – extensive bike parking, accessible without dismounting, or at the least without long walks. Wayfinding/ route simplification in the station, including minimising the need to use lifts and wander to and fro, by good layout design and ticket sales opportunities at every entrance. Our bike/rail specialist, Ewan, has prepared a report outlining the current state of bike provision on the main train types now in Scotland (or coming soon). The report is also on our rail page. There’s several good developments, but very disappointing and poor provision on the new HST trains from Edinburgh/Glasgow to Aberdeen/Inverness. All the sadder given that in non-bike respects the HSTs are a big improvement. For more on this see also page 2 of Spokesworker 12.3.19. Please contact your MSPs about this – not ScotRail, as it needs to be a Transport Scotland decision. Find your MSPs at parliament.scot. All class 170 trains to have a bike space in both end carriages – most do, but a significant number do not.